Wow! What a view! Gulf/Beach views from the living area and the master bedroom! Oh ya, and don’t forget about the roof top deck that provides stunning views of Siesta Key Beach and our gorgeous coastline and Gulf. 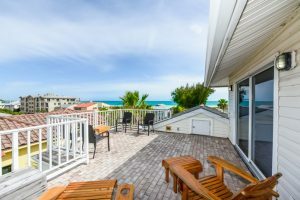 The home itself is conveniently located directly across from Siesta Key Beach Access 10 for immediate beach access, or you can walk 2 blocks to the Siesta Key Public Beach or 4 blocks to the fun area of Siesta Key Village. This 1/2 duplex has a private garage that makes it very easy to store your beach gear or vehicle, and a private elevator for access to all floors which is a great addition for those guests that don’t like stairs. It also has a private game room area with a pool table for your use only, located directly off the garage and pool areas. The home itself has 3 bedrooms plus a den off of the roof top deck, and sleeps 11 people in beds. It has been tastefully decorated and painted and it is a cute beachfront bungalow that will help make your vacation here in Siesta Key a great one. You’ll love the large open living room with gulf views from the balcony directly off this living space. You’ll also want to take advantage of the roof top deck that has unimpeded Gulf views. You’ll love this home, and so will everyone you are traveling with. Beach Towels are at the home for guests use. Beach chairs and equipment can be rented through the Adventure Tiki at a discounted rate. FREE WIFI. Please visit our site, call us, or email us if you have any questions regarding this home.